The squirrel cage designs are based on photos I took in the eastern Upper Peninsula in Michigan. The sources are: a grape arbor made from saplings, an unidentified tentacle fossil, seed pods, a waterfall, flowers, unidentified animal tracks in sand, a coral fossil. 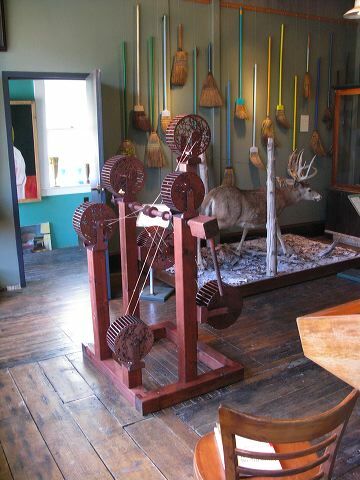 Distributed Squirrel Cage for Parallel Processing was created for and first shown at the indomitable Main Street Museum in White River Junction, Vermont in the fall of 2008. It was next installed as part of The Future Imaginary at Ben Maltz Gallery at Otis College of Art and Design in LA from January 24th - March 28th, 2009. 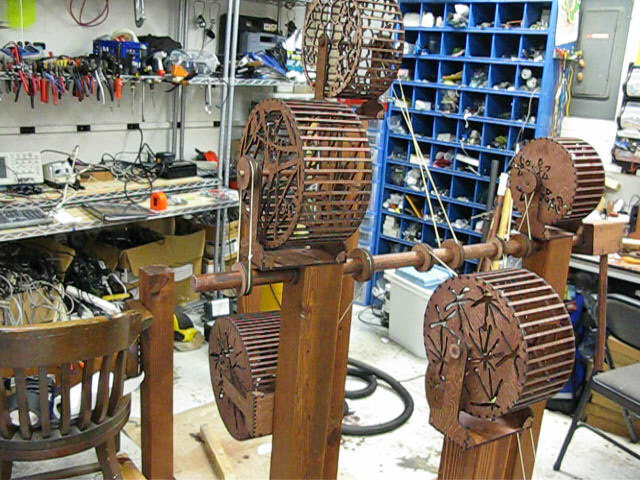 Special thanks to Richard McMaster for his tireless help cutting, gluing, and staining the squirrel cages. And thanks to David Fairbanks Ford, the Main Street Museum, and the whole WRJ crew for their eternal support and encouragment. White River Junction: It's Not So Bad! Thanks also to the terrific crew at the Ben Maltz Gallery for their help and kindness.